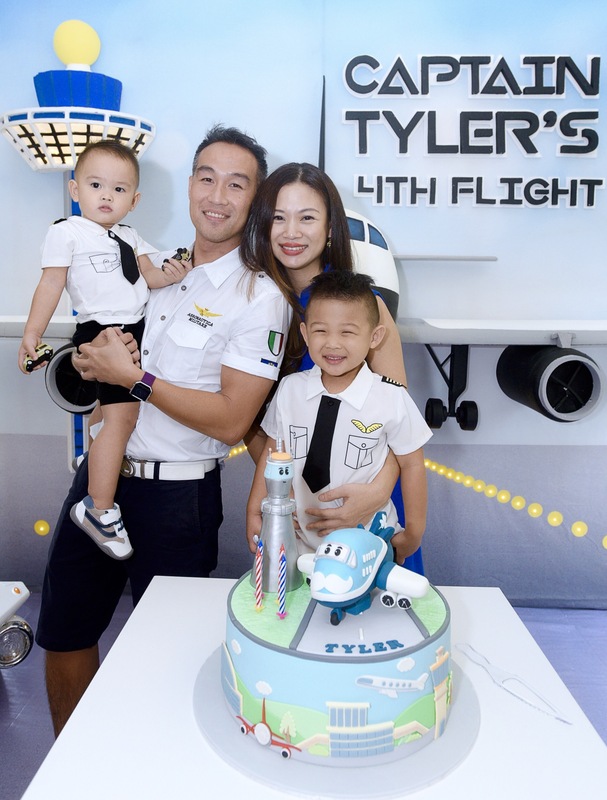 Tyler turns four! 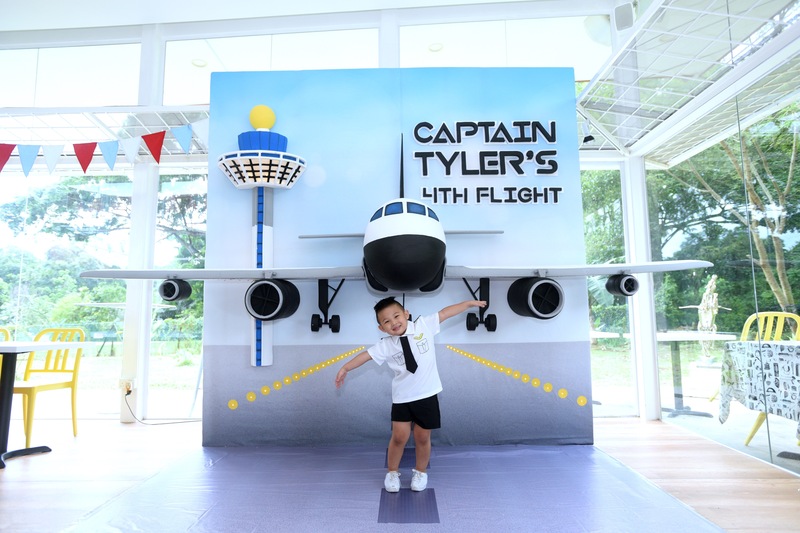 This happy, cheeky little fellow is still loving airplanes, so we decided to do another airplane-themed party – but with a change from last year. 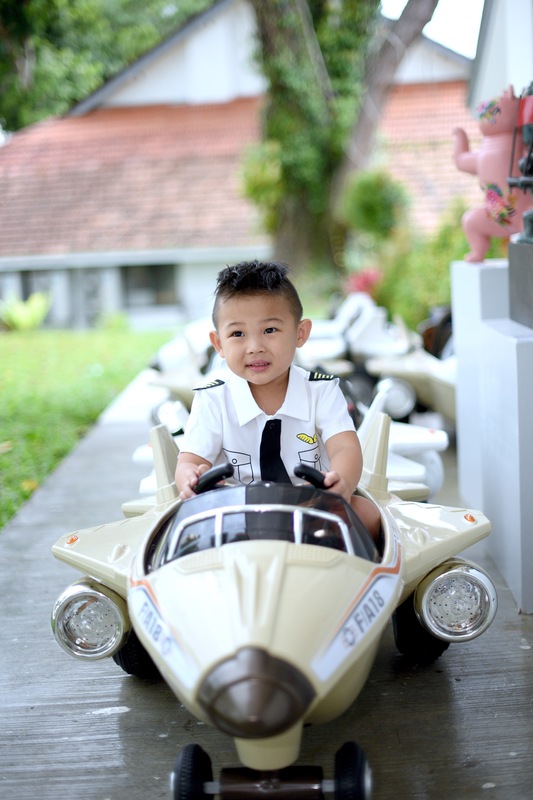 The party this year focuses more on Airports and Travel; where last year he was a fighter pilot, this year he’s a plane captain! First, a quick look at the venue. We discovered the MOCA Cafe driving past in the Dempsey area, where I spotted an all-glass restaurant in a lush, green setting. 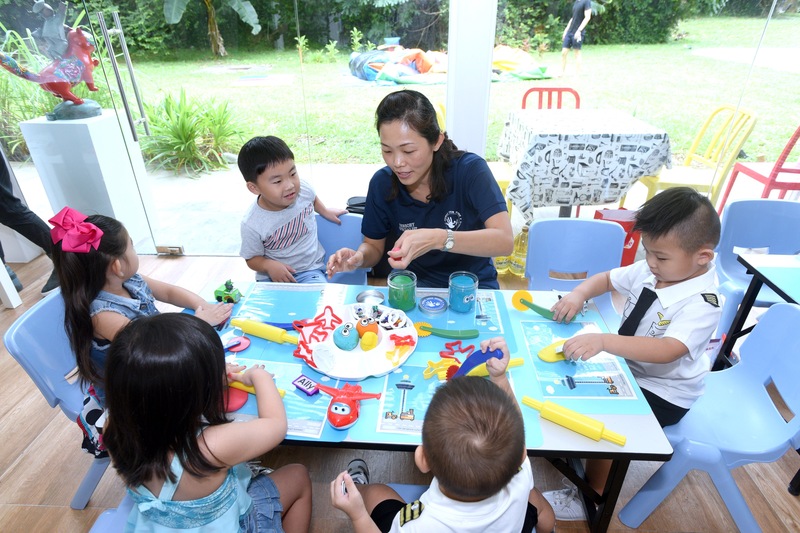 We stopped by to take a look, and it was blessed with plenty of beautiful usable outdoor space, which parents could see from within the air-conditioned glass cafe. It was perfect for the kids party I had in mind! In front, we parked the Air Force fleet. 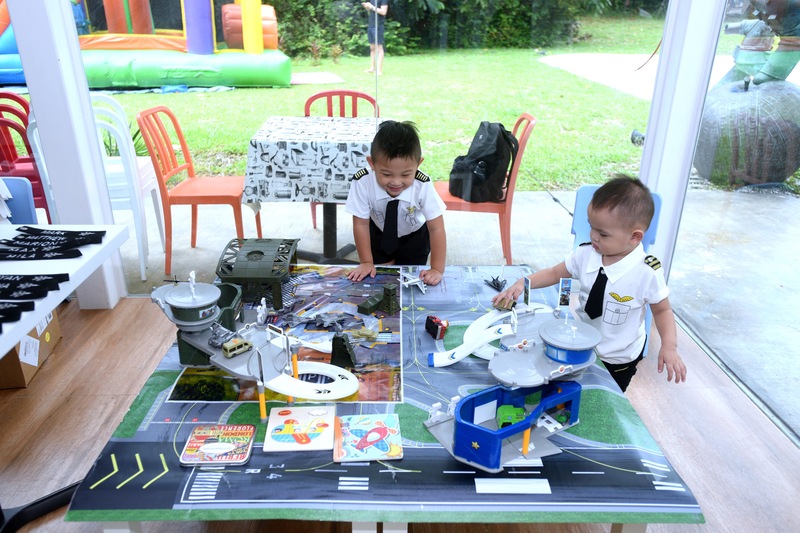 Eight mechanized planes, with a full runway setup in the outdoor space. We used masking tape to create runway markings and stationed blinking yellow lights (picked up from the Beach Road Army Market) to create the effect of a real runway! 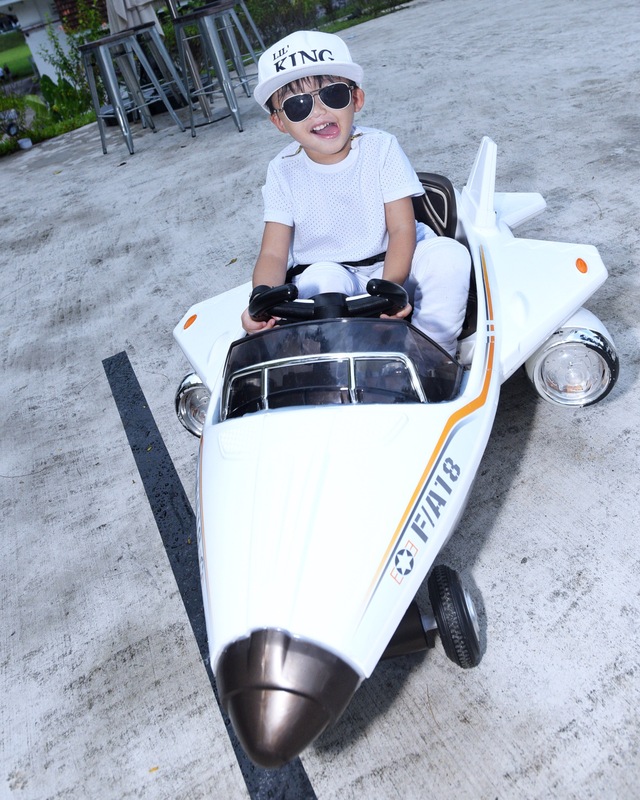 Captain Tyler Lim is ready for take-off! A wide-angled view of the space with the MOCA Cafe in the backdrop. 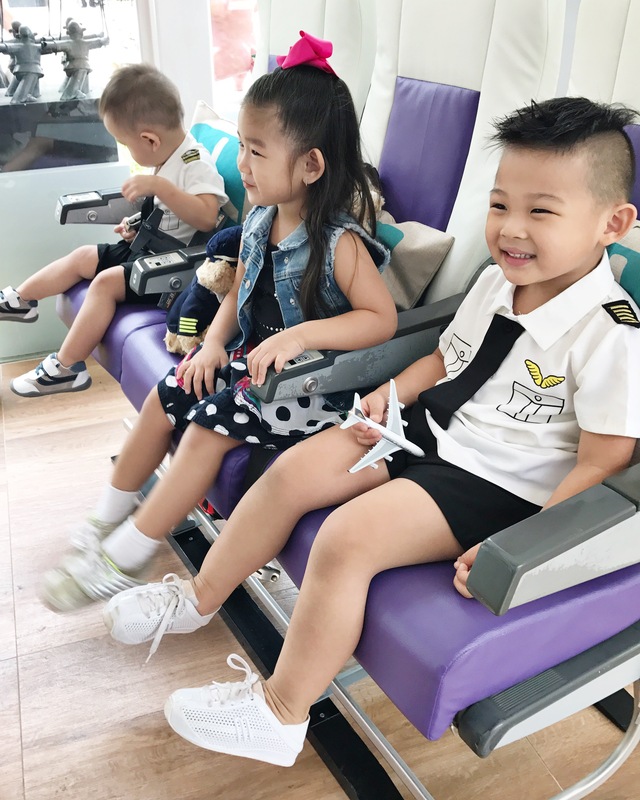 Little guests had so much fun zipping around on the motor planes! Moving indoors… Let’s start with that stunning 3D feature wall. Yes, it’s amazing! 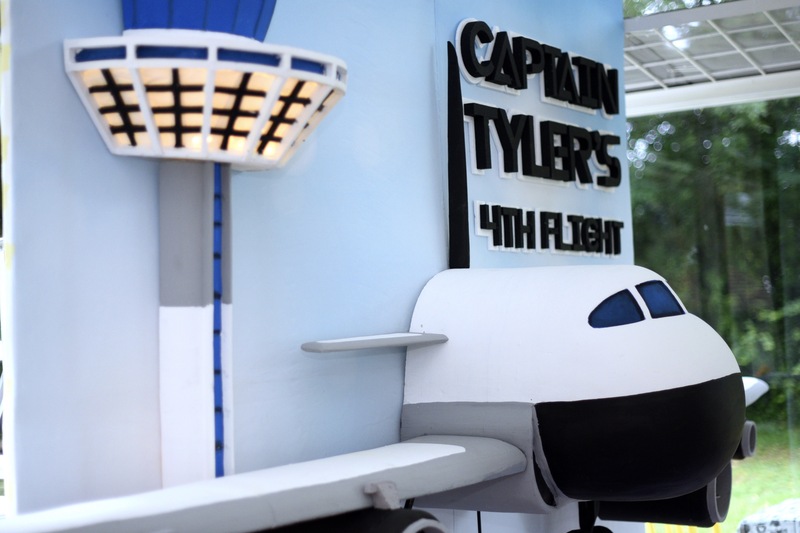 It’s a 3D cut-out airplane with a pop-out control tower and runway that actually lit up! This statement backdrop was designed and produced by Fairy Floss Party and provided the “wow” factor. Not to mention, it lit up my little birthday boy’s face like fireworks in a night sky. It also made for great party photos! 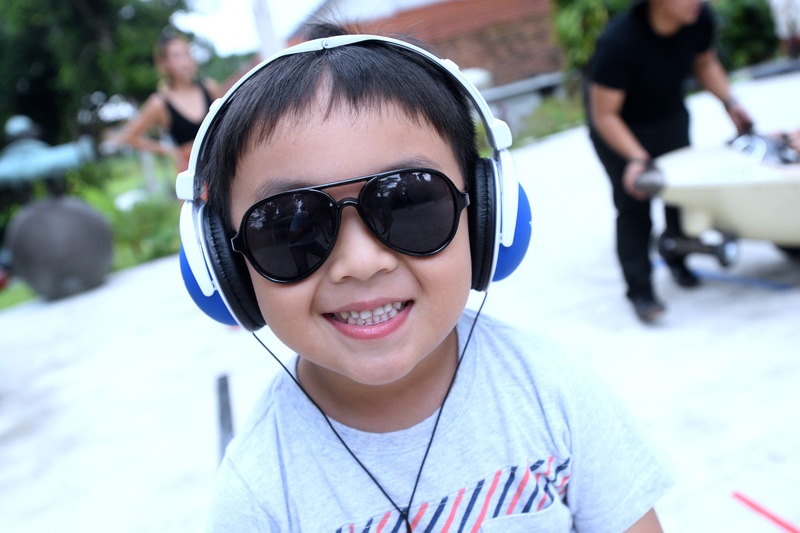 Little party-goers had so much fun with all the pilot-themed props like aviators and headphones! The other stars of the party, are of course the dessert table and THE CAKE. 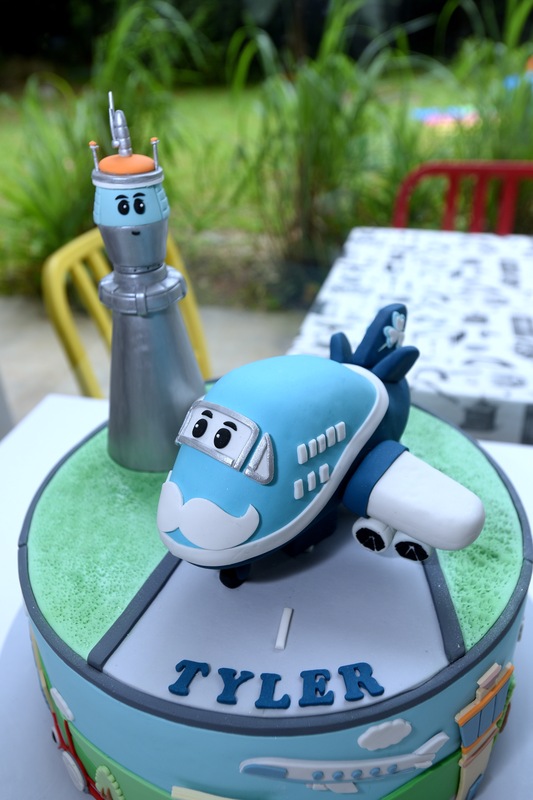 This beautiful fondant cake (notice the details all around) with a 3D plane character (Long Long from Airport Diaries) and Control Tower was created by Little House of Dreams. 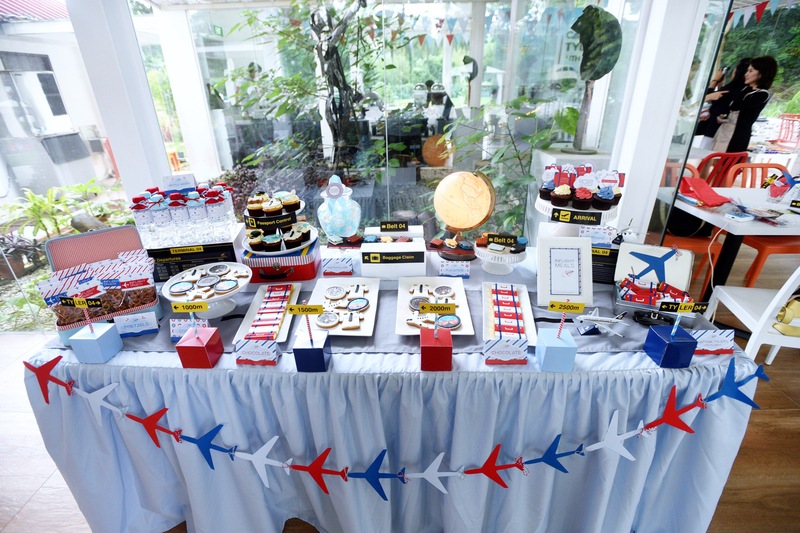 Taking a closer look at the gorgeous dessert table…. I loved the stylish red and blue spread created by Fairy Floss Party. 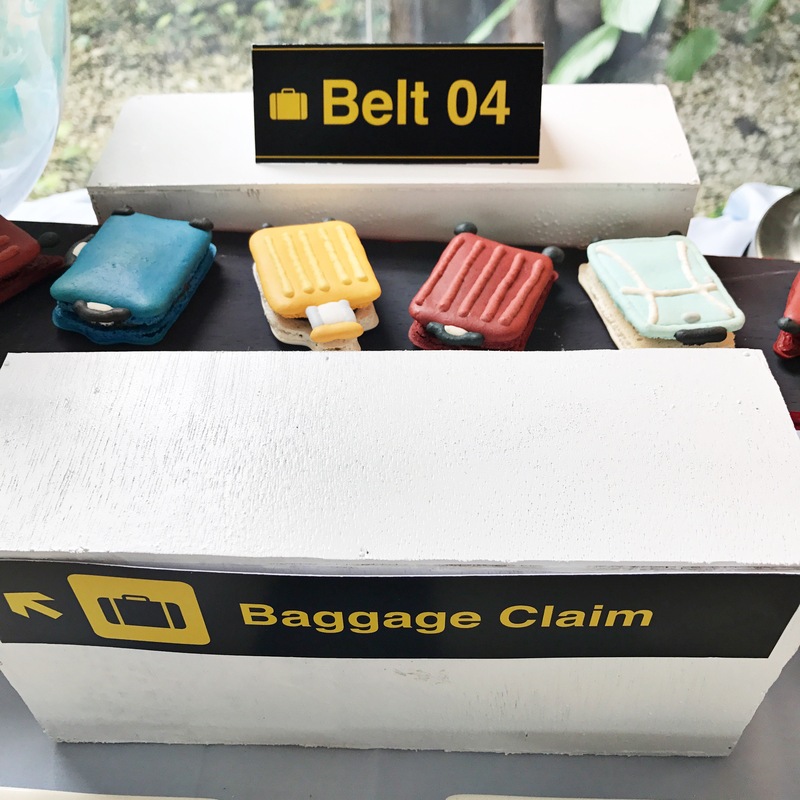 Featuring suitcase macarons on a luggage belt, bottles “jet fuel” for hydration, chocolate suitcases and many delightful little details. 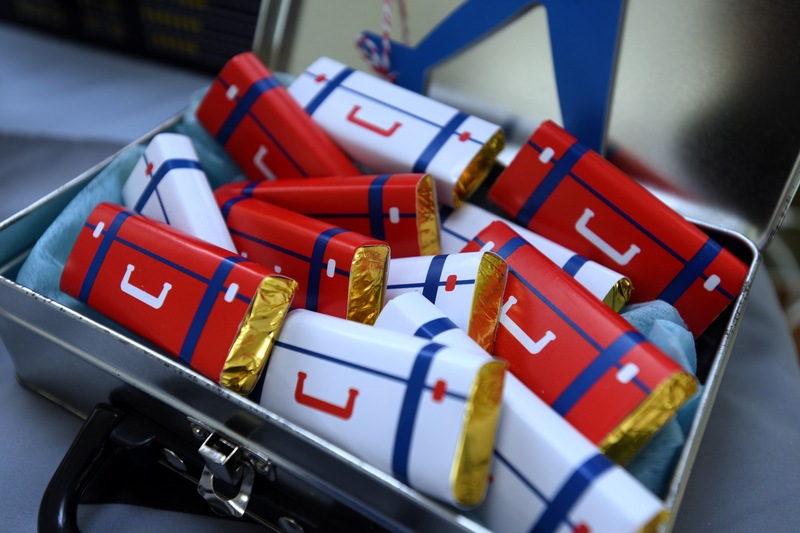 Macarons on a luggage belt Flight-themed cookies Chocolate wrapped like suitcases Cupcakes on arrival Bottled jet-fuel for refuelling! One of my favorite elements in party-planning is to have awesome gifts! 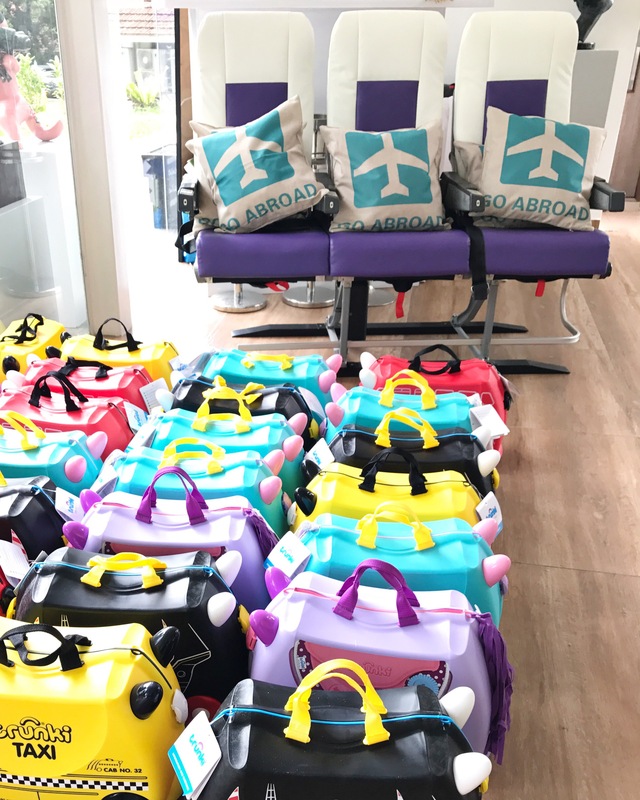 I ordered 25 ride-on Trunki luggage (for the kids aged between 1 to 5) and let the little passengers choose their own design – between Unicorns, Pirate Ships, Yellow Taxis, Red Buses and Bluebell Broncos – half the fun was in choosing their favorite ride-on luggage! 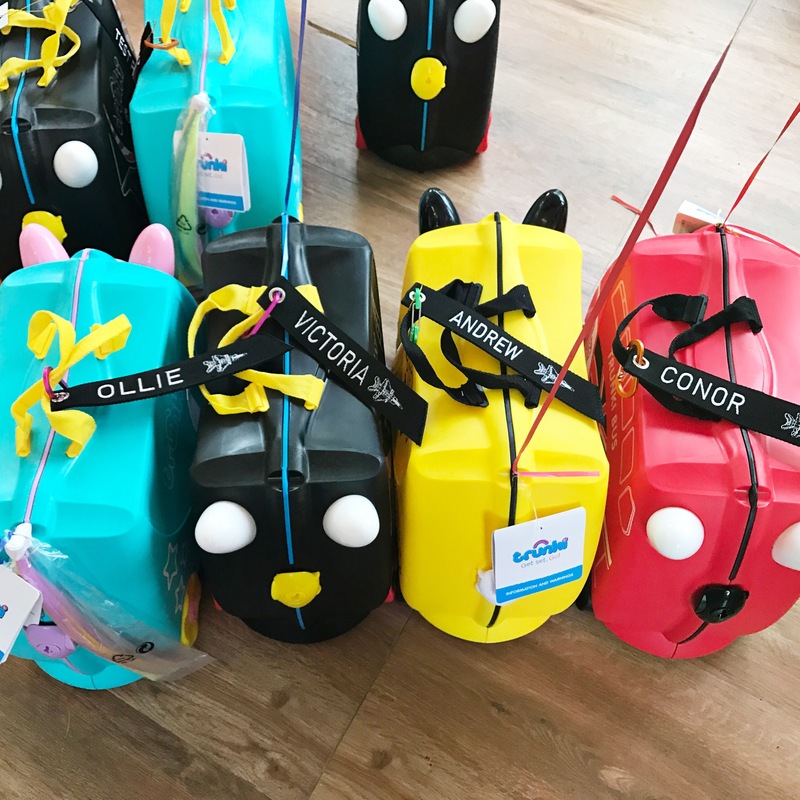 Once they chose their Trunki, they were able to claim it with personalised embroidered flight tags. 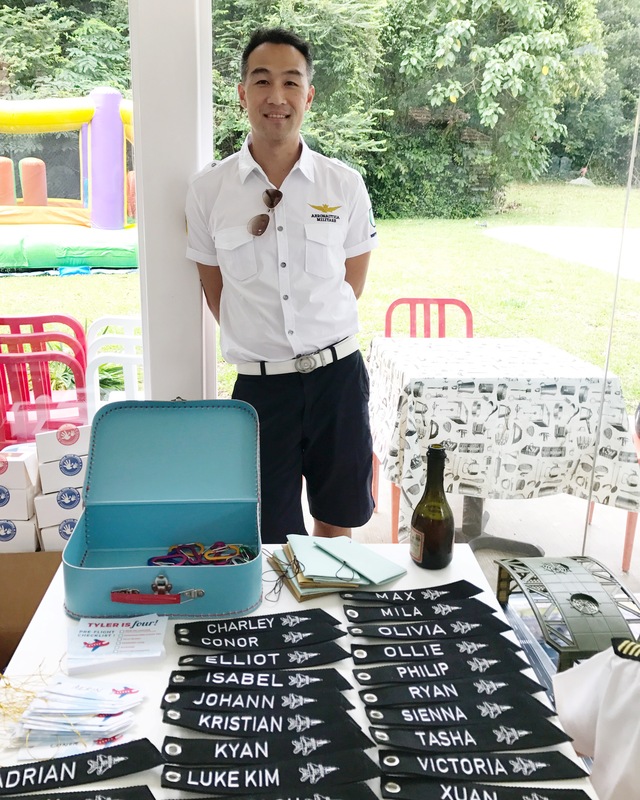 I placed the name tags on the entry table where they were able to pick up theirs, choose a coloured carabiner, and voila! 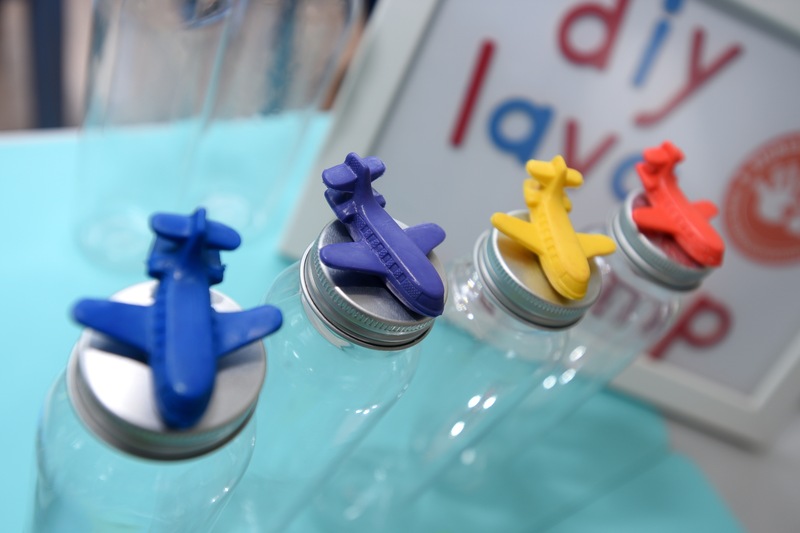 – a cool name tag for their Trunki luggage, travel suitcase or even school bag. I got these made at the Beach Road Army Market. It took about a week, I gave them all the names and they produced the tags which are in a nice thick canvas belt material with an embroidered airplane. Here’s an up-close look. The tags come in many colours and you can also choose different font colours (like red, organs or neon yellow which I thought was cool) but I chose the white as I wanted the kids to be able to choose coloured caribiners. 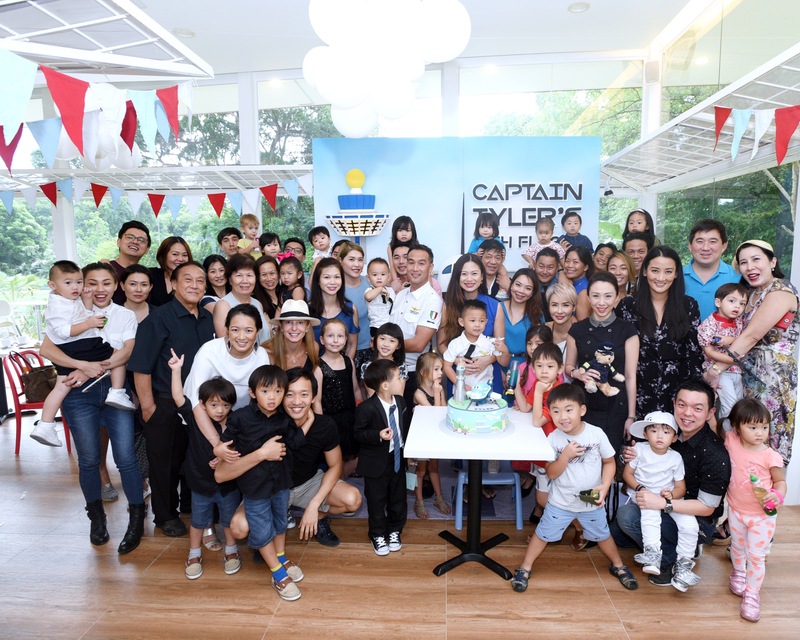 Captain J Lim greets the passengers! 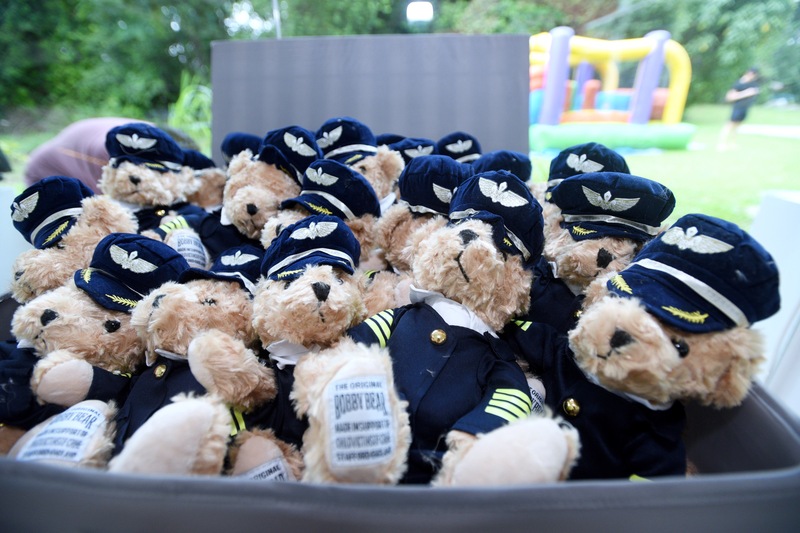 Once they collected their Trunkis, they got to fill them with travel and pilot-themed goodies ranging from Aviator shades to passport covers, pilot headphones and even a co-pilot buddy bear! This little guy is all kitted out! 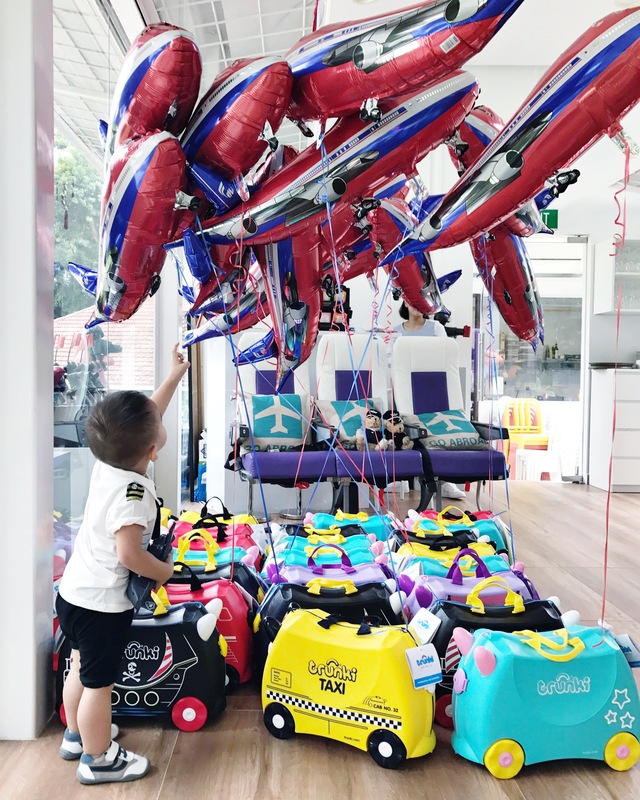 We tied floating airplane balloons to the luggage, so it looked like jet-liners filled the sky above! One simple and very effective thing I did to entertain the kids, was to order four of those IKEA coffee tables (the square white ones that are $12 each) and joined them to make a giant play table that was just the right height for the kids. 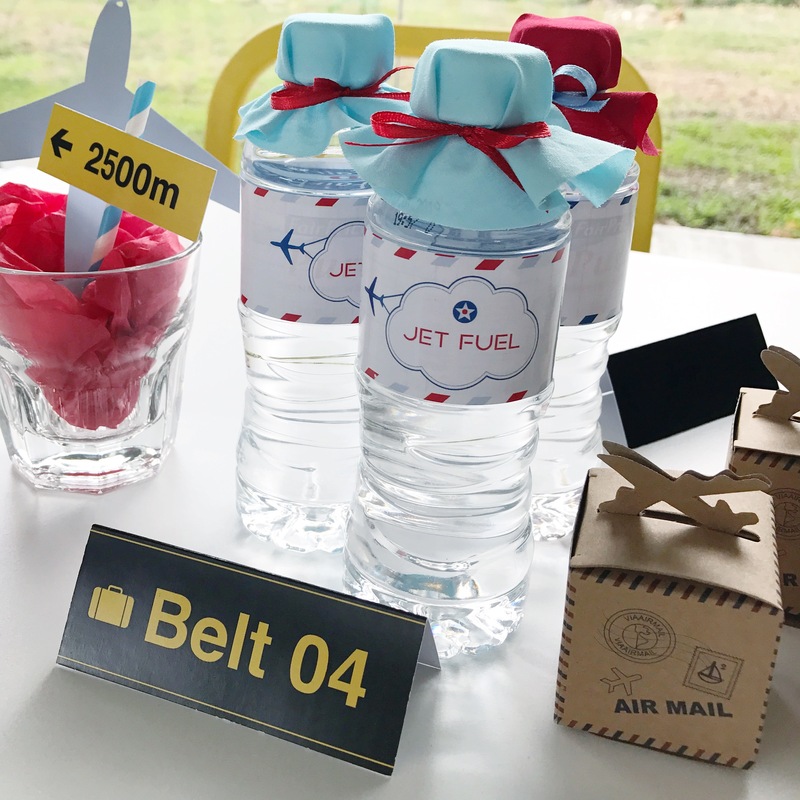 I ordered a runway poster online and placed two airport sets on it to create our very own Airport Experience Table! 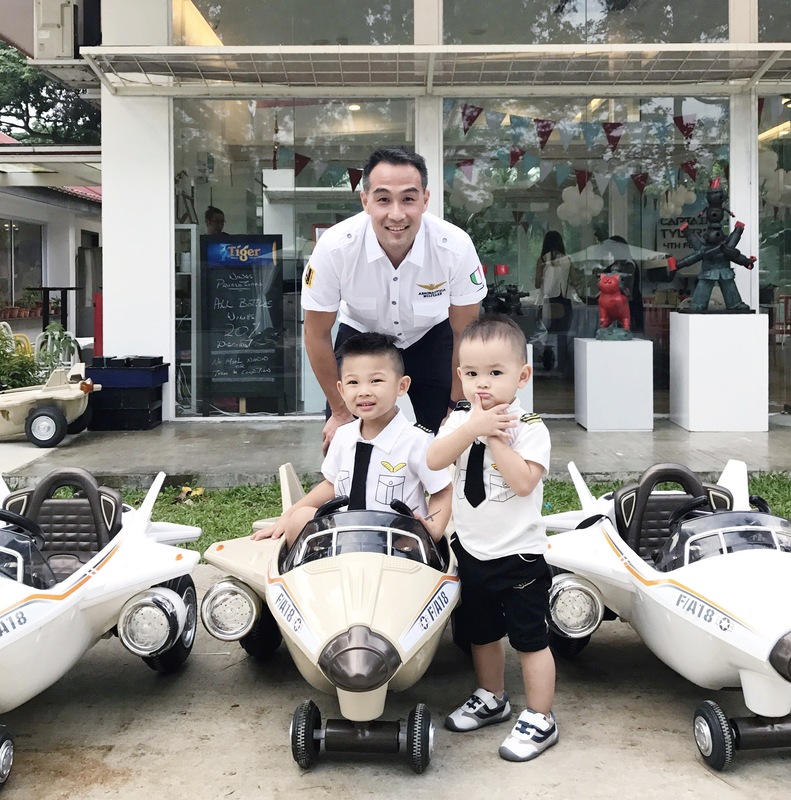 This was very popular with the kids, from 1 year to 6 years, providing them with quiet time for hands-on imaginative play, in between activities like getting air time in the bouncy castle and riding the little jet planes outdoors. 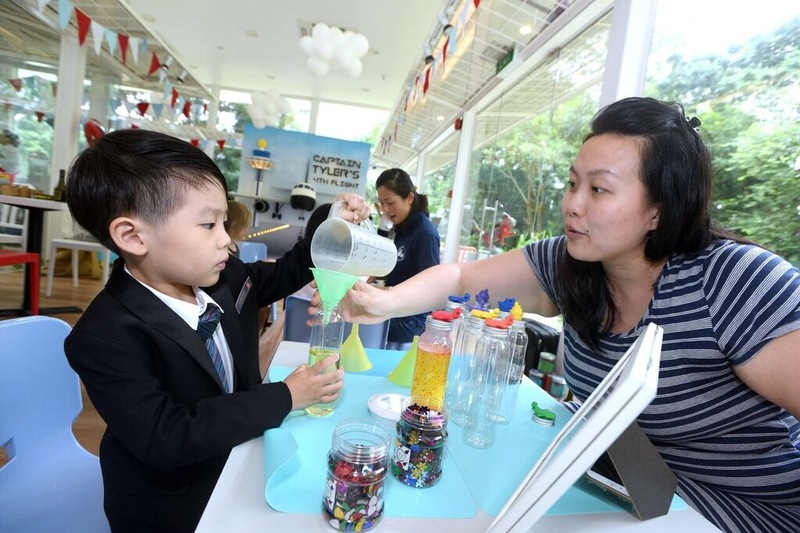 Another big treat for the little guests was the sensory table operated by Tickle Your Senses. They’re super creative and can work with any theme you come up with! 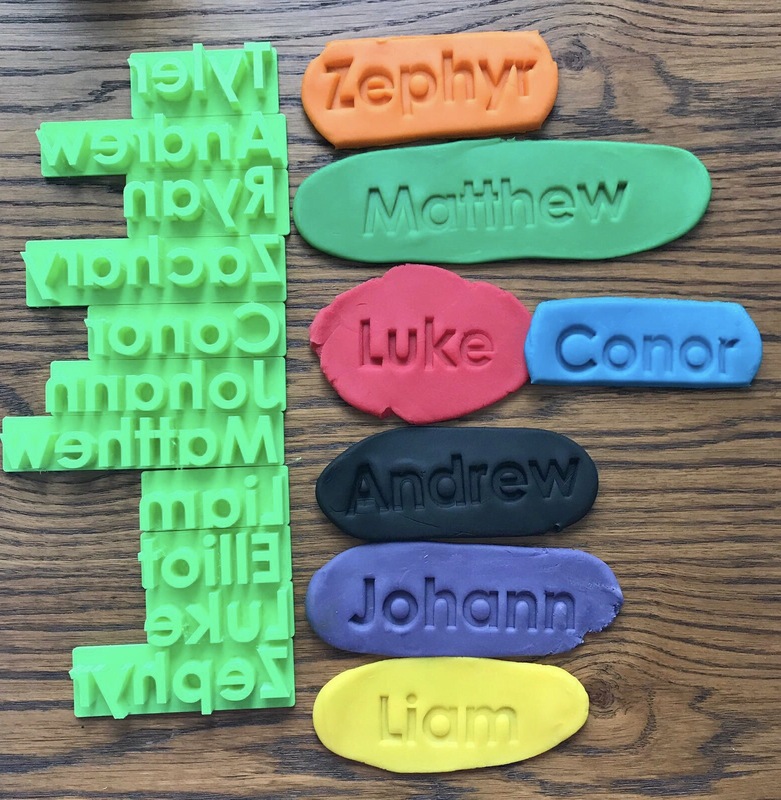 Check out these amazing personalised name stamps that they came up with! 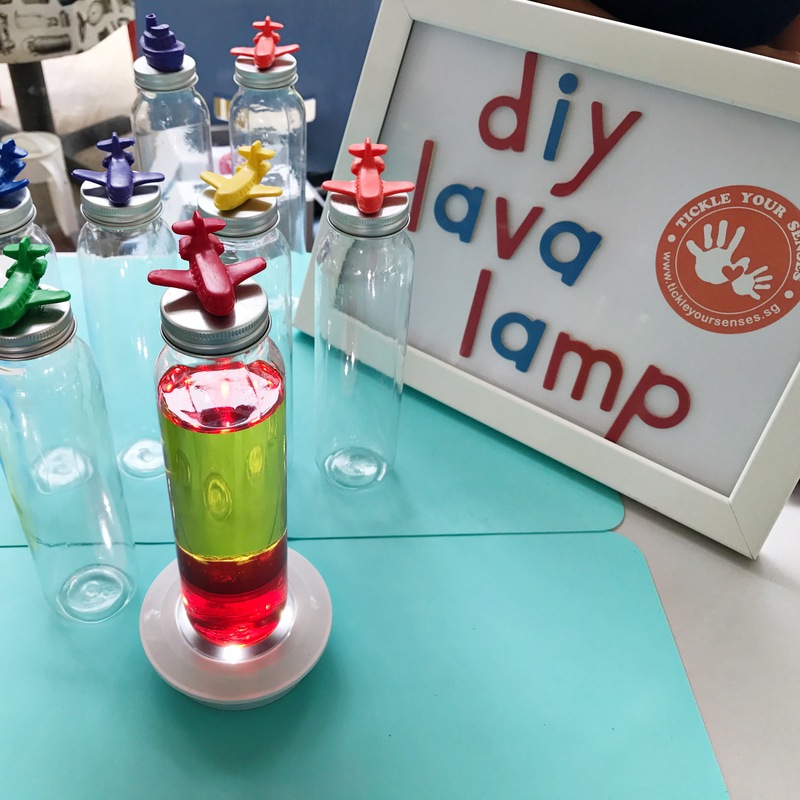 In addition to the personalised name stampers, they got to take home their own play doh kits, and make lave lamps with airplane toppers. 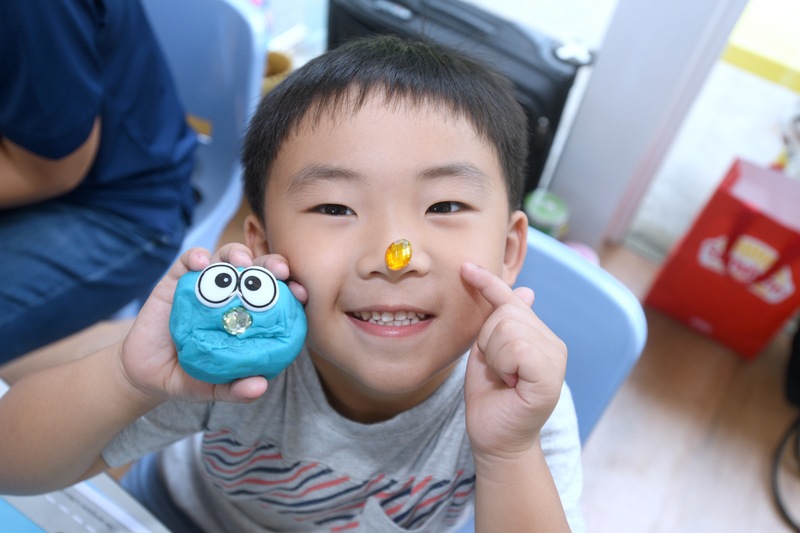 Highly recommended sensory play that entertains both younger and older kids (about 2 to 7 years). Finally, one of my favorite details from the setup was this retro airplane seat, complete with movable arms, seat belt and tray table! We rented it from Lorgan’s Retro store along Pasir Panjang Road, they deliver and pick it up, service included in the rental fee (about 30% of purchase price). The in-flight Steward demonstrates the seat functions! As expected, the kids love sitting in it! A great place for friends and family portraits! 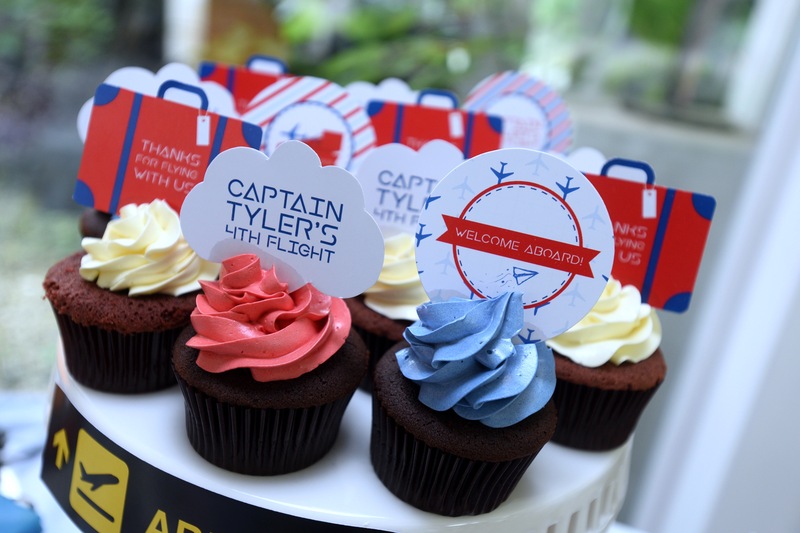 Thank you everyone for flying with Captain Tyler for his 4th Birthday Party. 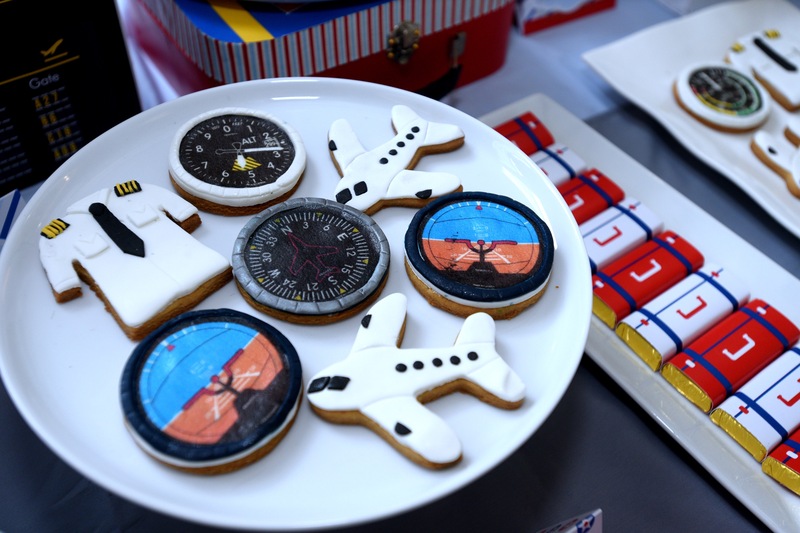 Hope you had as much fun sharing our party details as we did putting it together (#OCDMom)! 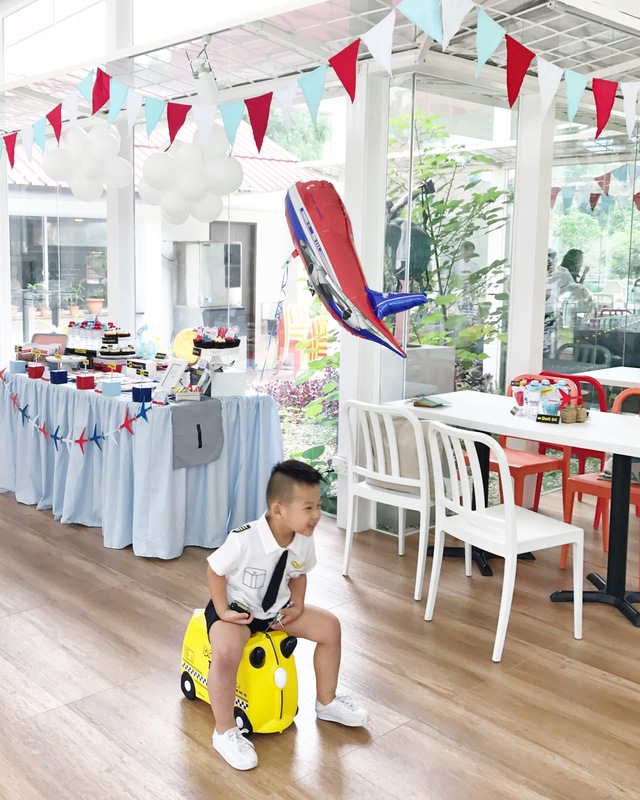 ← Jake’s First Birthday – It’s a Panda Party! Hi, may I know where did you get the motorised plane? May I know where you got the pilot shirts?